But, as they say, the best time to plant a tree is fifty years ago, and the second best time is now. After ridding our side yard of the “decorative” stump that loomed over the lawn, we began a protracted search for a replacement tree. As I do, I developed a long list of mandatory criteria that no tree could ever meet. It needed to live a long time, it needed to look good year round (but especially in the fall), it should be large, but not too large, and it needed to be happy in the heat of central North Carolina summers. We considered and rejected nearly every sort of tree commonly available at the local nursery: crabapple (too messy), maple (too common), cherry (too ephemeral), hawthorn (too thorny), dogwood (too slow-growing), redbud (too short-lived), oak (too big). At an impasse, we decided to defer our selection until spring, giving us time to brainstorm new options. 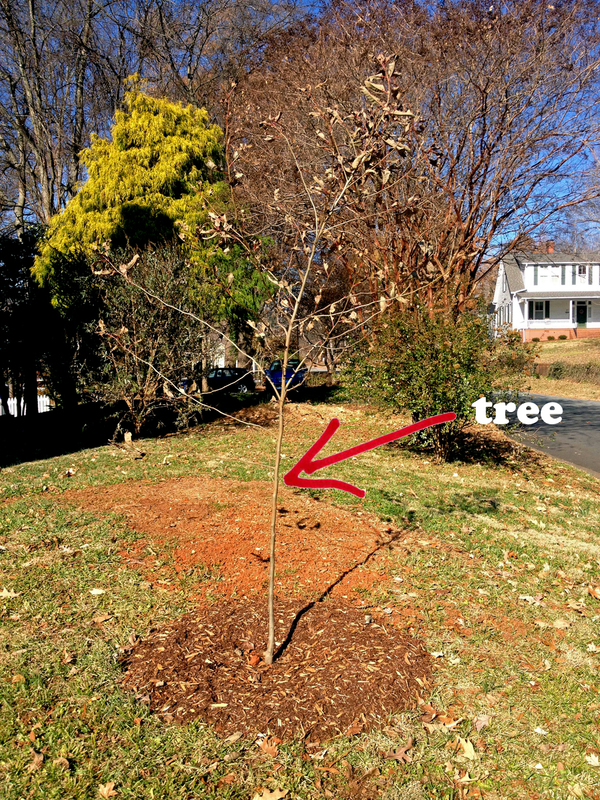 But, a chance encounter with one of our neighbors, an amateur tree buff, resulted in an unexpectedly perfect suggestion: a tupelo tree. Now, as far as I knew, Tupelo was just a town in Mississippi. Turns out it’s a type of tree too, alternately known as a black gum. And, in case you’re wondering, tupelo honey is honey made by bees collecting nectar from tupelo trees. As I read more about the tree, the more of my requirements it met. It’s native, growing naturally from Canada to Mexico. It’s big, but not too big, maxing out at 60 – 80 feet tall and 25 – 35 feet wide. It has a tidy growth habit with a straight trunk and branches that emerge at ninety degrees from it. It’s drought-tolerant once established, and can tolerate a range of soil types. It’s long-lived, averaging 250 years, but specimens 600 years or older have been identified. And, best of all, tupelos have spectacular bright red fall color, similar to a red maple. The tree might not look like much now, but in a few decades, I’ m confident our tupelo will be a familiar fixture in our corner of Hillsborough. Perhaps a few Christmas lights for now. Congrats on the research and decision. WIsh I could be here to see it at full growth. Perhaps from a different perspective! If it’s a gum tree, will it drop those pesky gumballs? No, sweet gums are the ones that shed the spiky balls. Tupelos don’t seem to have any nuisance behaviors. I have been reading your blog from start to finish with reckless abandon and have loved every moment of it thus far. I appreciate reading a blog written by a fellow architect and methodical over thinker. Just thought I would chime in saying that I also was struggling with a tree selection for my own house and settled on a Nyssa Sylvatica too. They are such a terrific tree in every way. I have had two spectacular fall shows thus far and am looking forward to many more to come. We are blessed (cursed?) with the polar opposite of your halloween trick-or-treat attendance with over 400 ghosts and gouls ringing our doorbell this past fall. Isn’t it a great tree? Our is just now starting to form buds, and I’m anxious to see how it settles in for its second year in our yard. Can’t wait to check out your blog…it’s nice to be reminded that t there are others out there that suffer from the same tendency to hyper-analyze every decision. Thanks for reading!